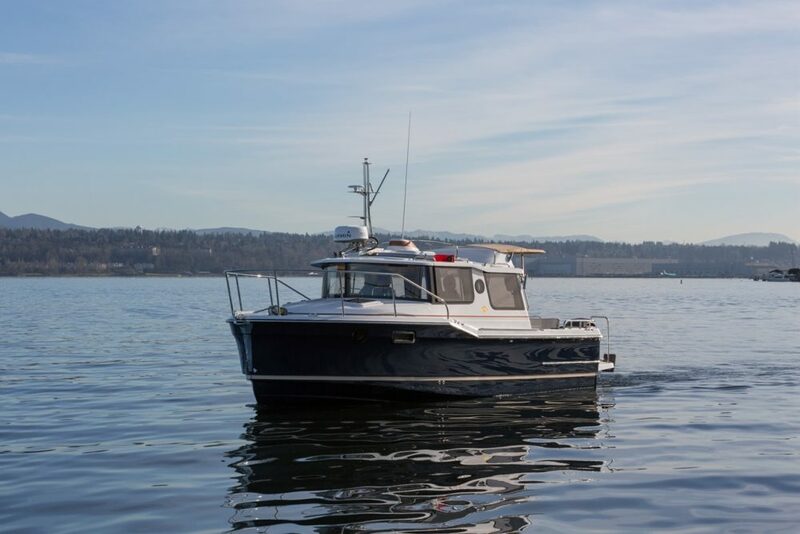 Pod drive handling, a planing hull, and an unbeatable liveaboard flow come together on the 38 SE. A Sabre 38 Salon Express powered by IPS pod drives was about to be my third test in the Sabre powerboat line, and I was looking forward to it—the 38 SE needed to be delivered from San Diego to Newport Beach, a run of about 65 miles, and I jumped at the opportunity to jump aboard. My previous tests on the Sabre 48 and the Sabre 40 (which then morphed into the 42) were entertaining for two reasons: first, these were ample opportunities to play with pod drives on highly responsive boats, and second, each Sabre I’ve reviewed has been a treasure trove of clever details. With this new baby in the Sabre family, I wasn’t going to be disappointed. In fact, the 38 SE added a third feature that sets it apart – great livability created by a fantastic indoor/outdoor flow. With pods below the waterline and a resin-infused hull, the Sabre performs like a boat with more horsepower - while burning less fuel. 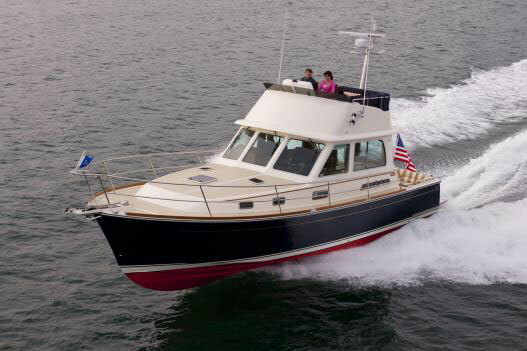 Sabre is a Maine boat builder which has long built ocean-going sailboats and is focused on delivering old-world craftsmanship neatly mixed with state-of-the-art technology. Today, their-V hull luxury powerboats are targeted at the high-end market and have surpassed Sabre’s sailboats in production volume. 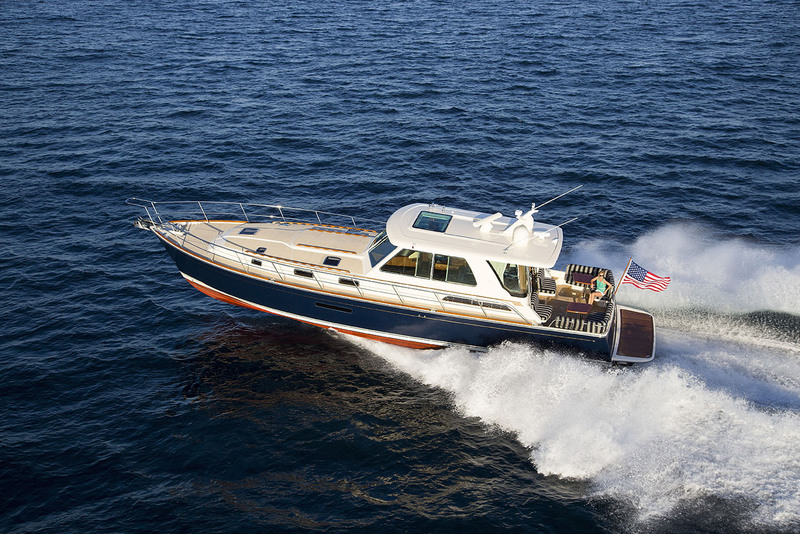 The planing hull of the 38 SE has a 24-degree deadrise amidships which tapers back to 17 degrees at the transom. The construction is resin infusion with bi-axial stringers bonded to a foam core to reduce weight. The result is a lighter, stronger boat that runs with smaller engines and has better fuel economy. 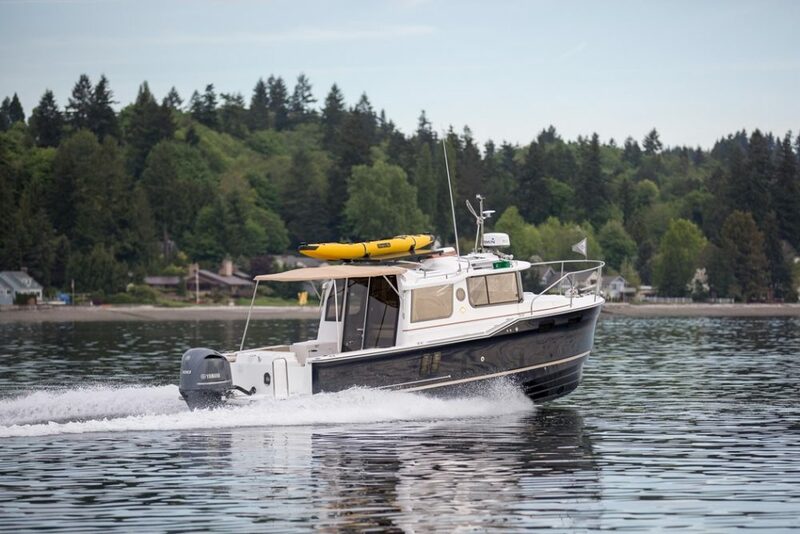 Designer Kevin Burns has mixed traditional Down East styling with high tech construction and created a boat that not only looks good but delivers good speeds and a respectable cruising range. I stepped aboard the swim platform and up into the cockpit that turned out to house my favorite feature. 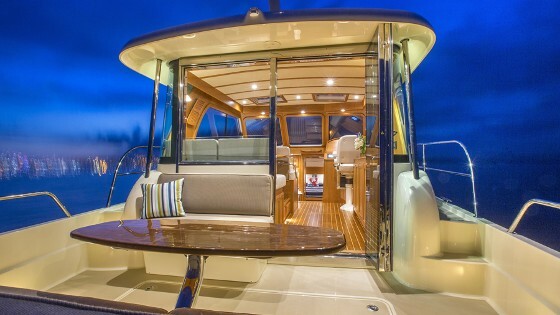 A straight settee, built into the transom and connected to a cherry wood table, slides back 14 inches over the swim platform to open up the cockpit. When under way, or to form a dinette with the other aft-facing settee, just slide the transom back in and lock it. Head thump—why isn’t that on other boats? The view from the transom settee - one of the author's favorite spots onboard - carries all the way through to the stateroom. The inviting flow of the cockpit continues to the inside when the large aft electric window lowers and the bi-fold glass door opens, effectively creating an indoor/outdoor great room. 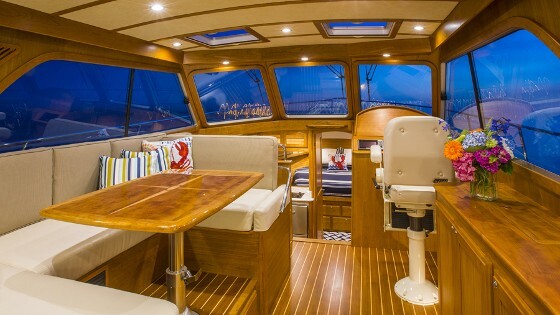 The salon is compact but efficient with a U-shaped settee and a hi-low pedestal table to port, and a cabinet with a pop-up LED TV and the helm to starboard. The backrest of the forward part of the settee swings aft and creates a small forward-facing L-shaped lounge so that seat does double duty. In one position you can have dinner, and in the other, you can keep the helmsman company underway. I had found my perch for much of the trip. 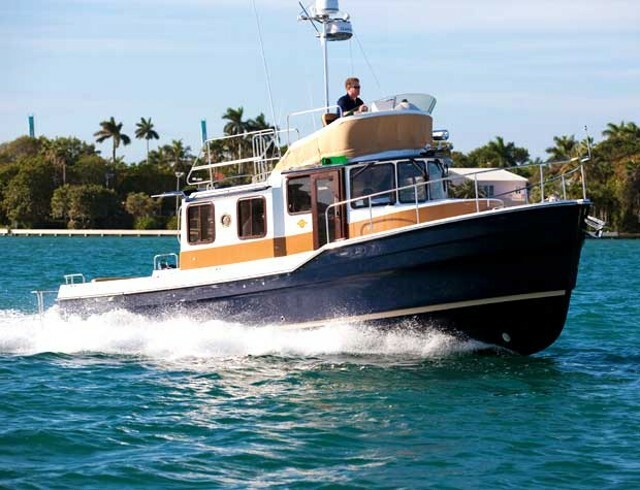 The helm has a Stidd chair, a Stazo wood-trimmed wheel and a well-laid out dash with Volvo Penta IPS electronic controls, a joystick, a single VHF, a Garmin 5215 multi-function display and a Volvo Penta color display. Everything is within reach and within view except for the compass, which is inexplicably tucked between the three-panel windshield and the back of the dash, visible to no one. Head thump again, but for a different reason. The galley is down three steps, which removes kitchen clutter from the social space but still leaves the cook connected to the conversation in the salon. There is a Kenyon electric cooktop, a microwave oven, two-drawer refrigeration, and significant stowage throughout. Aft of the galley is an open L-shaped lounge that converts to a double bed for the occasional guests or kids. Options here include a fixed portlight and a flatscreen TV. The master stateroom is forward with a queen-size island bed, stereo, and large drawers under the berth. It can be closed off for privacy or in the continued nod to flow, the door is opened and the panel that houses the 26” LED TV between the galley and the stateroom lowers to connect the cabin with the rest of the boat. In other words, you can lie in bed and see through the galley, up to the salon and out to that great transom settee that started it all. Sabre’s trademark satin cherry interior glows richly and the acres of windows all around the salon make it easy to see out even when seated. Air flow is good via twin hatches overhead which can also be upgraded to an electric sunroof over the helm and passenger seat. It’s a nice but expensive option, adding $15,000 to the bottom line. I’ll take the sliding hatches. Interior detail and joinery work is up to Sabre standards, with touches like a satin cherry finish and a Stidd helm seat. The boat came onto a plane around 15 knots with just a three degree bow rise and then cruised at 25 knots where it got about one mile to the gallon. The pod drives use smaller engines so they’re more efficient and higher speeds may be reached with less horsepower. According to Sabre, the consumption stays more-or-less the same between 20 knots and 30 knots, which is WOT. We stopped off next to a swimming buoy to practice close quarters maneuvering with the IPS pod drives and came at the buoy from various angles; the boat responded perfectly with a calm, predictable, fluid motion regardless of the direction. The crew, on the other hand, suddenly came to life with smiles all around as we looked like boat-driving geniuses, thanks to the ease and fun of pod drives. The lazy day livened right up. 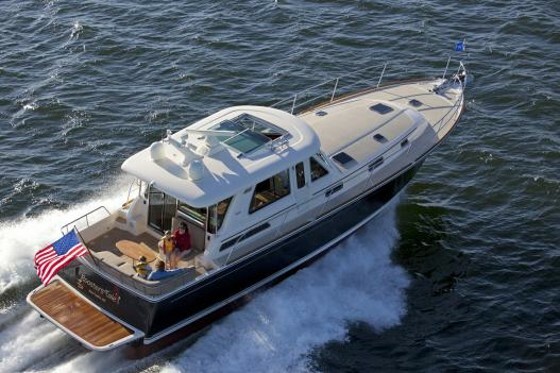 The twin Volvo Penta D4 300 hp diesels are accessed via the cockpit sole so maintenance is easy. Two 150-gallon rotomolded fuel tanks flank the 6 kW genset. Because the tanks are translucent, it’s a great visual back-up to the fuel gauges at the helm. With the hatch open, there’s plenty of room to work in fresh air and good light. A Reverso oil change system is a $1,400 option and to me, worth every penny to eliminate procrastination and deferred maintenance, as often happens when oil changes are difficult to do. 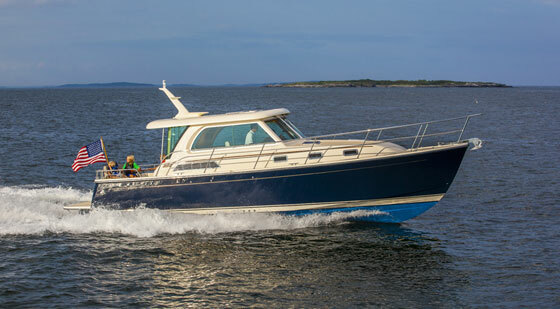 The base price of the Sabre 38 SE is $525,000 and our test boat came in around $580,000. 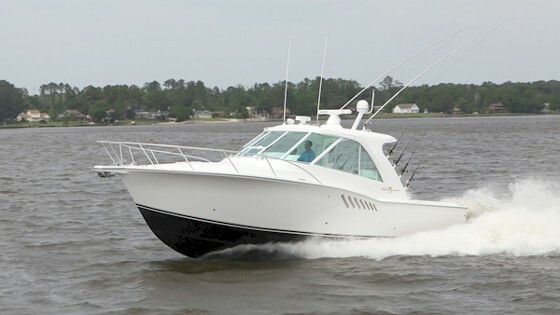 It is a well-built costal cruiser that is a perfect couple’s boat. And let’s mention that flow concept again. The best illustration of the excellent indoor/outdoor livability on this boat would be to sail a paper airplane from the swim platform through the salon and galley down to the headboard of the master stateroom bed. It makes a 38-foot boat seem big, airy and livable. How many designs can master that? 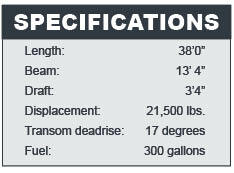 For more information, visit the Sabre 38 page.